The Celts were a vicious people, proud people. But it's their artwork,not their ferocity, that gave them immortality. These bracers capture the essence of Celtic artwork perfectly. 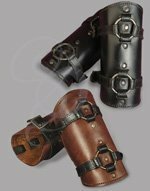 They are arguably the most beautiful bracers that we carry, and as part of the leatherworks collection, probably one of the best made as well. These are years ahead of most of the competition. While others are busy trying to hide rivets and spikes needed to cinch the leather together, our craftsmen have moved on to bigger and better techniques. They have abandoned these crude, cheap methods for crafting leather goods and have switched to 100% stitched materials. 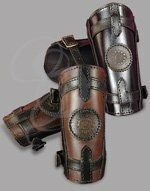 This gives much more authenticity and quality to their materials and is more in keeping with the time-honered techniques of leatherworking. 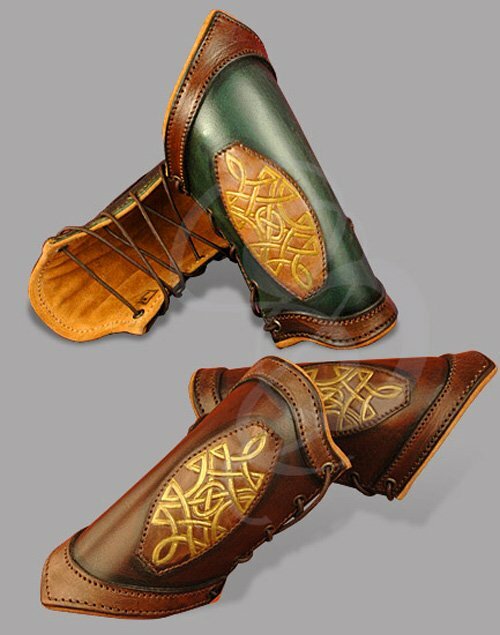 Each of these bracers is rigorously tested and quality controlled. 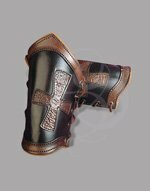 You will not find more consistently high quality craftsmanship on mass-market leather goods. Materials:Genuine Leather. Padded Internal Suedette Lining.